Might autumn be the most beloved time of year? (Or is that what we say at the start of every new season?) Either way, it's time for a new season which means new seasonal festivities and favorites. Don't let fall sneak past you without some of the crisp weather fun that comes along with it. The summer bucket list was such a hit, I had to create one for fall too. 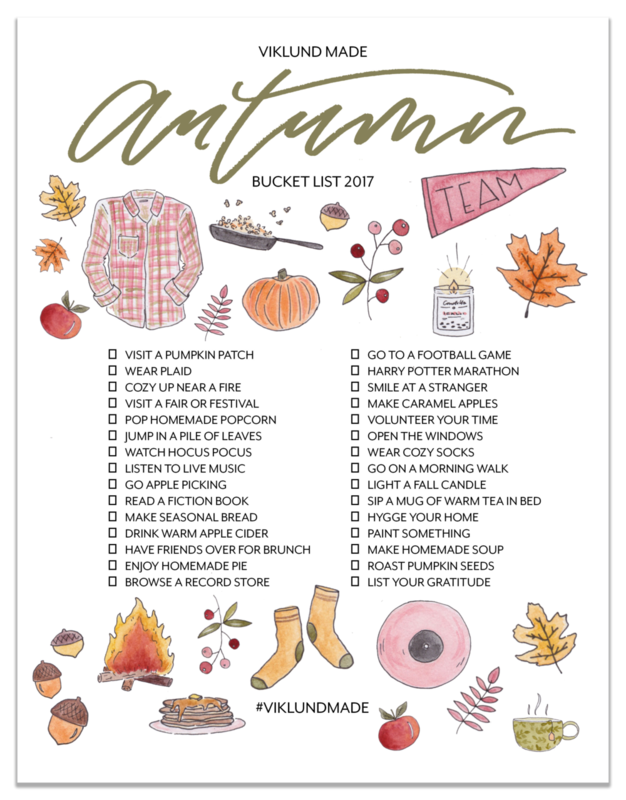 I believe this bucket list has captured all the must-dos of autumn and will be sure to make this one of your best seasons yet! You can get your free Viklund Made Autumn Bucket List 2017 download by CLICKING HERE, and it easily prints on a classic 8.5 x 11 sheet of paper (the stuff we use in any ole printer) at home, or your office (I won't tell! ), or the Kinko's down the street. How easy is that? Oh! And there are some fun links below to help you maximize your bucket list happenings, so be sure to check those out too. You may be wondering, what is hygge? Well here is my FAVORITE book on the topic, it's so cute and cozy. Someone recommended caramel apple bread, which sounds amazing, so here is a recipe for that! Need some great fall candles to light? Candelles has all my favorites, and their sister company will fulfill all of your fall inspired needs as well! May I also recommend an episode (or all of them?!) of Friday Night Lights on Netflix instead of attending a football game? Not sure what to serve your guests at the brunch you plan to host? One reader recommended pumpkin pancakes, don't those sound yummy? This spicy black bean and sweet potato soup is one of my favorites for autumn. Happy fall ya'll! Share your bucket list progress using the hashtag #VIKLUNDMADE on Instagram and by tagging me @brittanyviklund on Instagram, I'd love to see where your adventures take you and share them on my own Instagram account. Oh, and let me know what you think of these seasonal bucket lists and if you have any fun ideas for a winter one by leaving a comment below, I want to hear! Things have been pretty crazy around here recently. Between a 5-day trip back to New England for a wedding & an impending 10-day trip to Connecticut, New York City & Chicago I feel like I’m just trying to stay afloat. Here is a round up of some of the things that are currently helping me stay sane in their own ways. bObi PET ROBOTIC VACUUM CLEANER & MOP by bObsweep. If you keep up with me on Instagram you may have seen glimpses of our robotic vacuum named Tammy (after Tammy Taylor from Friday Night Lights). In all honesty I didn’t have the highest expectations of robotic vacuums, but I kept hearing great things about the bObsweep vacuums so I wanted to test it out myself. My husband was even twice as skeptical. Before we set her off on her merry little way we actually swept & mopped to ease her into our household of 3 humans, 3 cats & 2 dogs. Immediately after we cleaned we put her to work & after about an hour her collection pan was completely full of dirt & hair. We were stunned. We put her to work 4 days out of the past week and holy moly. Our floors have been immaculate & my husband (yes, he does the sweeping & proudly self-identifies as “Cinderelly”) was able to skip his weekend sweeping routine. He even asked me if I would personally email the company to let them know how fantastic this vacuum was, I’m not even joking. My dining room table is currently covered in stuff (10 pound bag of organic sugar, a Target sack with a blanket inside, baby bibs, junk mail, who knows what else…), there are two piles of laundry on the floor in Buddy’s room, & our windows are riddled with kitty nose smudges but our floors are sparkling clean & I don’t have to rinse my feet off every night before I crawl into bed (yes I do that) so I’m a pretty happy mama. 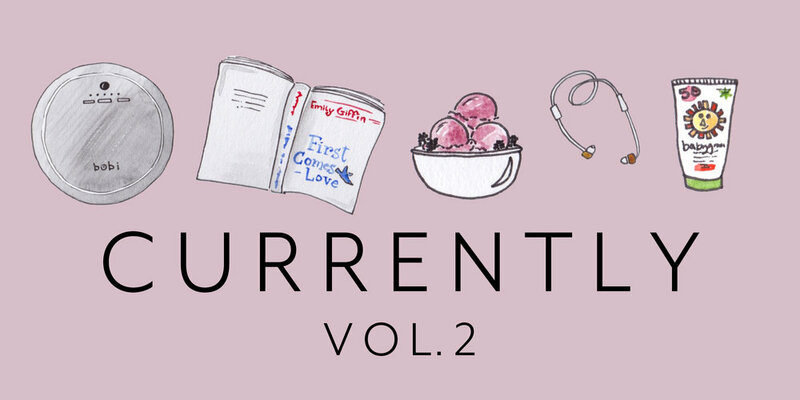 FIRST COMES LOVE by EMILY GIFFIN. For probably the past year or more I have read pregnancy, birth & baby books exclusively. I was craving a fiction read & decided to turn to my favorite author’s latest release. It’s been the perfect book to enjoy while traveling or to read a chapter before bed. The story is about two sisters as they navigate their lives & aspirations after a traumatic family incident. Emily Giffin’s books are some of my favorites: I always feel like I can relate to the characters somehow & her storytelling ability makes them hard to put down. If you haven’t read her first two books, Something Borrowed & Something Blue, I highly recommend those as well (in that order). They are two of my favorite books of all time. HOMEMADE BLACKBERRY ICE CREAM. A friend gifted us this ice cream maker when we got married & I finally gave it a go whipping up some blackberry ice cream that I found on Pinterest. OMG. It was fantastic. I decided to go with a custard-based recipe, it required a few extra steps but I was willing to make that happen for added creaminess. I top a bowl of it with either some dark chocolate candies or chocolate fudge & it makes the perfect summer treat. I've made t a goal to make more homemade ice cream this summer. SUDIO VASA BLÅ WIRELESS EARBUDS. Buddy is still napping in the Solly Baby Wrap one to two times a day. While he’s napping I try to get work done but often times the podcast (Up & Vanished Podcast people, get to it now!) or music I am listening to wakes him up. Headphones attached to my computer would be too constricting, but these wireless earbuds do the trick! I am able to move about freely, enjoy my podcast & get some work done all while Buddy is sleeping undisturbed on my chest. They are amazing at the gym too. The Bluetooth has wide range so I don’t have to keep my phone in my hands or attached to me, which is so liberating. Sudio is offering 15% off of their amazing products with the code “brittanyviklund” (no “c” in “Viklund”). BABYGANICS MINERAL BASED SUNSCREEN. We use all of the Babyganics line of products, but now that it’s summer, I was pumped to learn that they make a mineral based, SPF 50 sunscreen. Sunscreen can be full of yucky stuff that I don’t want being absorbed into my son’s skin, so finding a sunscreen that’s made with plant-based, organic ingredients & none of the nasty stuff like PABA, phthalates, parabens, fragrances or nano-particles helps me feel good about protecting his sensitive baby skin. We grabbed this travel size pack that also came with the natural insect repellant since I rarely use a bottle of sunscreen before it expires. Thank you to bObsweep & Sudio for providing their products; they truly have been game changers for us. J.Crew Always Chambray Shirt: I have purchased this top twice now (the first one I tore while playing beach frisbee some years ago) & it has consistently remained a staple in my wardrobe. The material has structure enough to make it flattering but is soft enough to keep you comfy. The quality is also fantastic (just don’t wear it while playing beach frisbee okay?). I currently love it with a loose tank layered underneath. And I may or may not wear it 4 out of 7 days of the week. Bright Starts Lots of Links: Buddy is at the stage where he loves putting any & everything in his mouth & these links allow us to give him that access in different ways. We have used them to extend the toys on his play gyms so he can chew (“gum”?) on them & he loves it. We also use the links to keep toys within his reach on his car seat. They come in fun colors & different textures so even on their own they manage to entertain him. P.S. His FAVORITE thing to have hanging on the links is this fun Nuby Safari Friends Baby Teether. 13 Reasons Why on Netflix: We stumbled upon this show a few weeks ago & were immediately sucked in for several reasons. Initially it was the cliff hanging, dramatic-mystery feel to it & our desire to understand more. But even within the first episode it got my husband & I discussing life for teenagers in the current day and age & what that will one day mean for us as parents. Both of us left high school right before the debut of social media, & we are both so interested by the impact it has in kids’ lives because we were right on the cusp of that generation (when we were freshmen in college Facebook was brand new & exclusive only to college students). Even more importantly, the show confronts challenging topics regarding emotional health, suicide, sexism, sexuality & sexual abuse, bullying & substance abuse & other prevalent issues that aren’t widely discussed. If you end up watching the show there are some pretty graphic scenes, just as a heads up. I also recommend watching the 30-minute interview with the cast & producers afterwards. I Love You Rituals by Becky A. Bailey: I’ve been a big fan of Becky Bailey since my work in early childhood education began 8 years ago & I find her insights just as valuable (perhaps more?!) as a new parent. What I love about this book is the first few chapters give a brief overview of the author’s behavior philosophy & then the majority of the book is the “I Love You Rituals”, which are fun, intentional ways to strengthen your bond with your child & develop their social-emotional skills. A few weeks ago I shared some parenting/child development books on my Instagram that I am interested in reading & asked if anyone would be interested in doing a virtual book study. The response was exciting! In a few weeks I’ll be sharing a more detailed review of this text with some questions to discuss. If you are interested in joining in feel free to get your hands on a copy of the book & dig in.